Thirteen children and adults were taken to local hospitals Friday after a school bus crash in Greenwood, County, South Carolina, officials said. School officials told CBS Spartanburg affiliate WSPA that the school bus was carrying Westwood Elementary School students on a field trip. 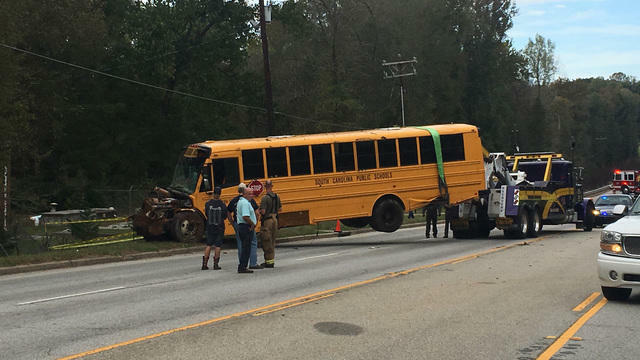 There were 29 students and 5 adult passengers on board in addition to the bus driver, the South Carolina Department of Public Safety tweeted Friday. WSPA reported the bus went off the right side of the road, hit a utility pole and a fence, and then traveled down an embankment. Highway patrol told WSPA that nine students were among the students were transported to hospitals. The bus driver was among those injured. Abbeville County School District Superintendent Betty Jo Hall told WSPA that one student and two adults were airlifted to a local hospital. Hall said no one was in critical condition.